The plasmonic sensor is an improvement of the current state-of-the-art method for a few reasons. First, it was able to improve the limit of detection by at least two orders of magnitude. In fact, most methods aren’t able to accurately detect the presence of CEA until it reaches a higher concentration. Secondly, because it works with much less instrumentation, it is less expensive and more portable and doesn’t require nearly the expertise to make a reading. It also means instead of needing a vile of blood for a test, a simple finger prick will do. This aspect will be especially important for those who don’t live close to an advanced medical facility, including those in developing nations. Schematic illustration of the multilayer nanoLCA (ML-nanoLCA) showing the multilayer structure and direction of illumination. The device combines two sensing methods, which hadn’t until this time been able to be used together. First, it uses a 3D multi-layer nanocavity in a nanocup array, which allows for the light to be stored in the cavity comprised of two metal layers (in this case gold) surrounding one insulator layer.Secondly, it uses plasmonic sensing, which detects sensitive nanoscale light-matter interactions with biomolecules on the device surface. It produces an enhanced field confinement and an enhanced localized field. Because of the plasmonic structure, the light is out-coupled more efficiently as the surrounding refractive index changes. 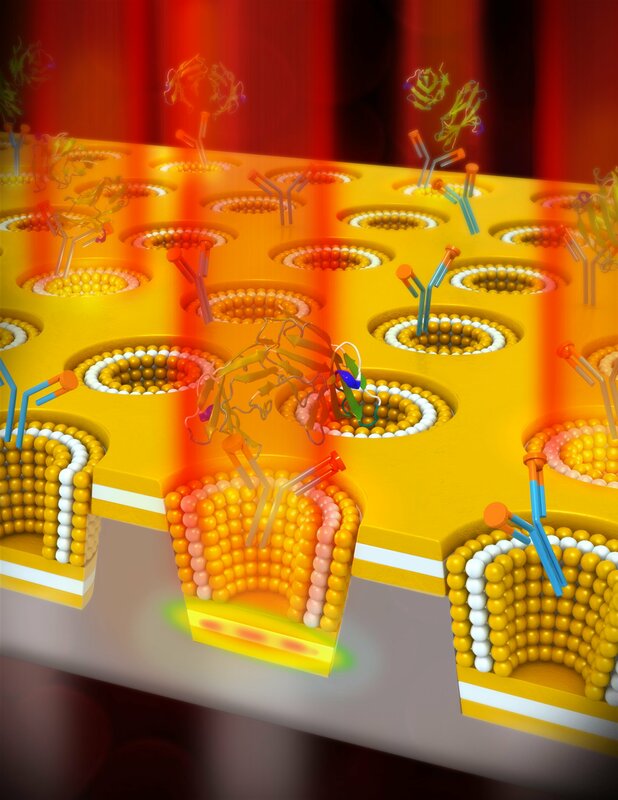 This image shows a plasmonic nanocup metal-insulator-metal cavity design used to detect the cancer biomarker CEA. The nanocavity leads to optical energy storage which is out-coupled to the far field by a refractive index increase. Therefore, CEA binding to its immobilized antibody leads to a sensitive increase in the transmission intensity at the resonance wavelength with no spectral shift. “By combining plasmonic properties and the optical cavity properties together in one device we are able to detect lower concentration of biomarker by light confinement and transmission in the cavity layer and from the top of the device respectively, based on the thickness of the multilayers and the refractive index of the cavity layer,” Ameen explained. Electromagnetic simulation of a single nanocup on ML-nanoLCA showing the field intensity in the cross section. “Because of our multi-layer high-performing plasmonic structure, we were able to very efficiently scatter out the light to the far field,” Hackett said. “When you increase the refractive index of the sensing region, it causes the stored energy to couple out. Usually when you have these types of refractometric plasmonic sensors, you have a shift in the angle or a change in your wavelength when the resonance condition is met. In our case, because we have incorporated a nanocavity, we have a fixed resonance wavelength.”As the concentration of biomolecules (in this case CEA) increases, so does the refractive index, which produces an increase of the transmission intensity at a fixed wavelength that can be easily detected.